WARNING: THIS POST ISN’T REALLY ABOUT THE RECIPE. There’s a story today on Yahoo! about some woman who found a snake, yep, snake, in a bag of potatoes she purchased at Walmart. This got me thinking about the unwanteds I have found in foods over the past 100 years. I had an infestation of small brownish bugs in my kitchen once – by once I mean for about 2 weeks a year for 3 years I would find them creepy crawling up my cabinets or sneaking around in my breadcrumbs…eww. Blamed the flowers a male suitor had sent me. Anyone who has ever dated me since knows never to send me flowers. Take note. When I first moved to NYC and my age was my salary – which we all thought was pretty cool at the time – I lived with about 1,000 other kids in an amazing brownstone in Brooklyn Heights. I didn’t really cook, and by ‘really’, I mean not at all. So, many nights I existed on fried rice from the local Chinese place on Montague Street – $4.75 and I could make it last for three meals. Sure, I dabbled. There were tuna melts, grilled cheese and Raman noodle nights (I could fry stuff and boil water!). But, mostly when I didn’t have any left over fried rice, dinner was cold cereal. That’s right, ‘ready-to-eat’ cereal that we would purchase at the bodega between the Borough Hall Subway Stop and our house. One night, my roommate/ BFF and I were walking home together – a rarity as she was an I-banker (read, worked late and made a lot more money) and I was in publishing (read, left work between 5 – 6pm and, well, we already discussed my salary). We stopped at the bodega to get some ‘dinner’. Jane, as she prefers to be called these days, selected a lovely box of Raisin Bran. I…it doesn’t matter what I got – the story is about her cereal. Anyhoo, we trekked home, poured our cereals into bowls and topped with milk. We were hungry – growing girls – and stood together in the kitchen, shoveling it in. At about bite three, Jane started frothing at the mouth…literally spitting the tasty bran and raisins back in to the bowl. She slammed the bowl on to the kitchen counter, continued spitting, wiping her tongue with a paper towel and just pointed her shaking finger at the bowl. So…I looked….Still wish I hadn’t…But, I looked. How could I not? And, there it was…the cereal was….uhmmmm…moving. Yeah….Her cereal was moving. Like totally moving. Like horror movie moving. I looked more closely and the cereal was alive with maggots. Still makes me shiver. Haven’t eaten raisin bran since…OK, no big sacrifice cuz this blogger hates the raisins. But, still…uhmmmm…ewww. 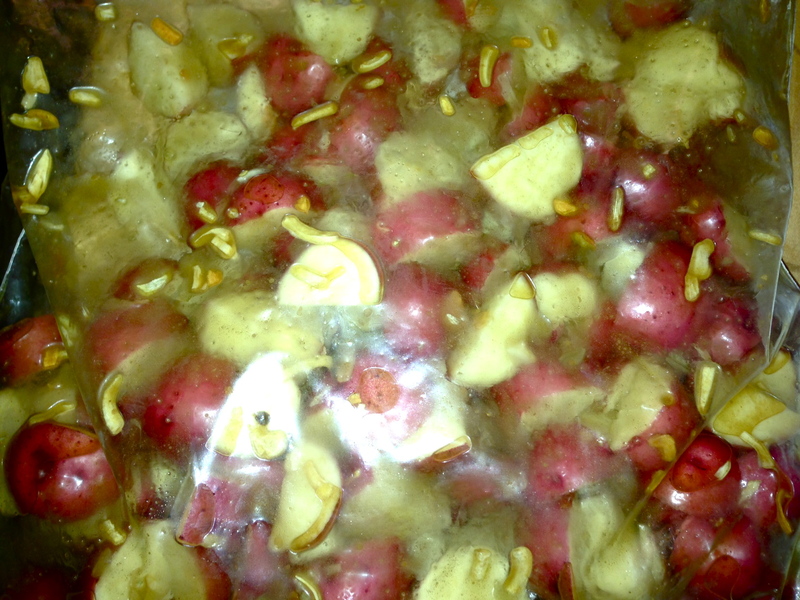 So, after what I went through with the maggots and then with the floral delivery bug invasion…you might think that the Walmart-Snake-in-the-Potatoes story might scare me off of a starchy potato treat. 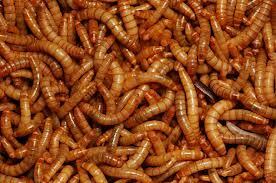 Au contraire…It would take a truck load of maggots to move me off of potatoes. 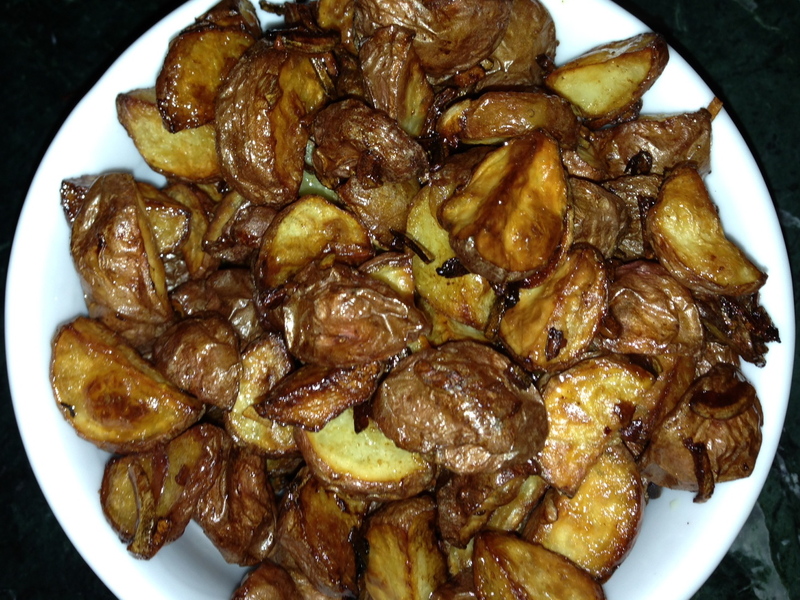 Here is my go-to simple, crowd-pleasing, snake and maggot-free roasted potato side dish. 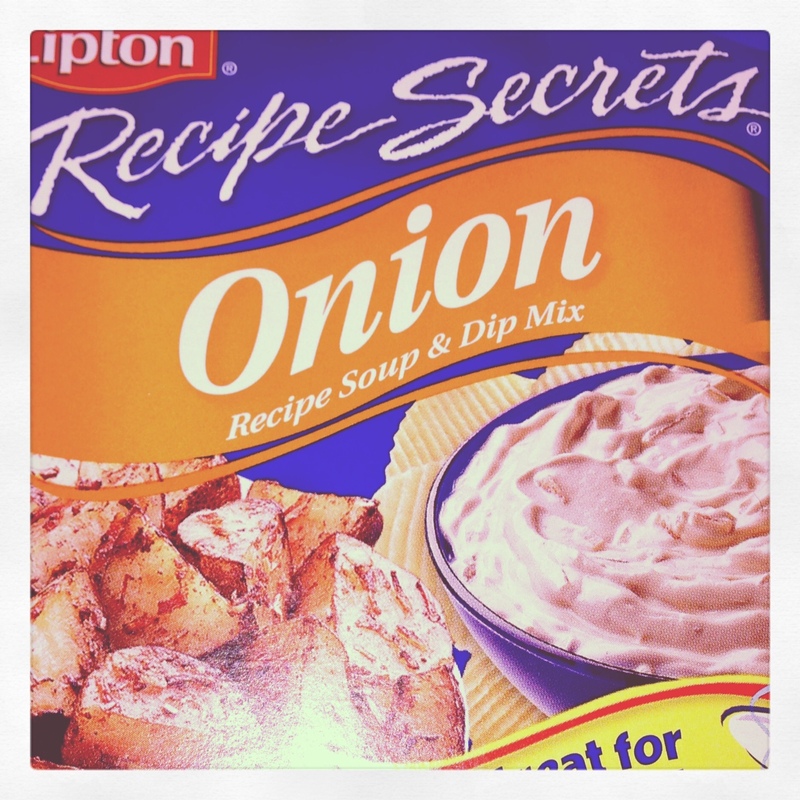 When you buy the french onion soup mix – Lipton, of course – take the packets out of the box and store upright in a cabinet – the box takes up too much space. 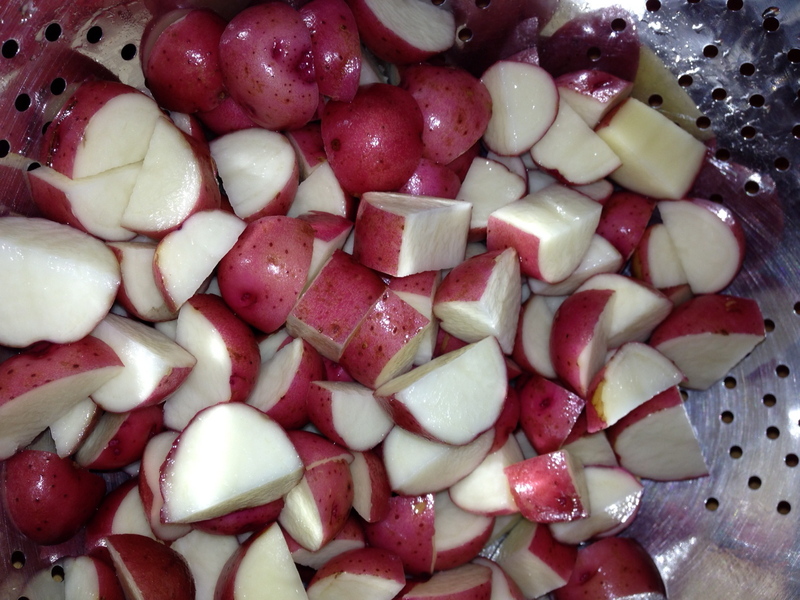 Like a pound of small potatoes – new potatoes or purple potatoes are good or if you’re fancy those bags with the three colors of potatoes…maybe not Yukon gold potatoes – they’re too soft. 9. 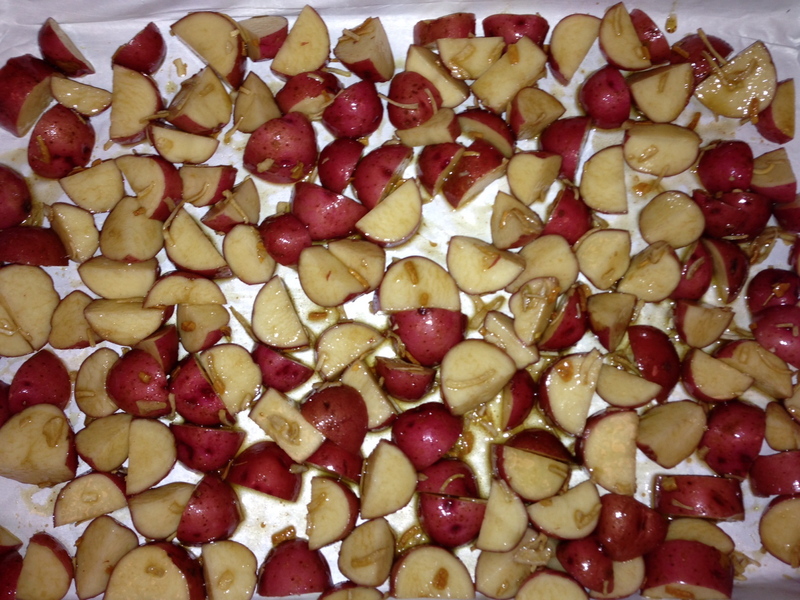 Put in the oven and bake for :45 – :60 minutes tossing a few times during the cooking process. Cooking time depends on how crispy you like ’em. I like my potatoes crispy. My favorite late night fry is the one that is actually void of any potato flesh. Truth. I like potatoes. Is there a support group for that? Even though there was APPARENTLY a smallish snake in one particular package at one particular Walmart – I will continue to eat the potatoes. I might even buy them at Walmart. When it comes to potatoes – even maggots couldn’t drive me away.